It might sound as if it was coming straight from a Science Fiction series but NASA and other scientist groups are predicting a heavy solar storm today that could leave your electronics stranded, affecting GPS and other driving tools. What some are predicting as the largest solar event since late 2006 is shaping up to disrupt your day today. Corona mass ejection is the technical term for sun storms that eject gigantic amounts of matter, triggering intense magnetic fields that eventually disturb our satellite with serious consequences. What it amounts to is that satellites loose some function and can trigger data lose, as well as other fluctuations. As the massive solar storm hit our planet early today, it is expected to disturb the globe's magnetic field for some days to come. For those of you lucky enough to witness it, it will expand all the way to the aurora borealis phenomena, otherwise known as the Northern Lights. The storm erupted as a massive solar flare earlier this week but grew in intensity as it raced away from the sun to the Earth. Much like a cosmic giant soap bubble, scientists predicted when it would strike today, those particles will be traveling at 4 million mph hitting the Earth. Indeed, according to Joe Kunches, a scientist for the National Oceanic and Atmospheric Administration in Boulder, Colorado, commenting on the storm; “It’s hitting us right in the nose,”. Technically Speaking. Let’s get a little technical. According to NASA, the leading edge of the March 6 coronal mass ejection, CME is getting close to its Advanced Composition Explorer, ACE satellite. ACE orbits just outside of Earth's magnetosphere magnetic environment. These magnetic field telescope observed those solar flares in the most volatile activity of the Sun, named the Active Region 1429. What this means is that as the magnetic fields from the CMEs interacts with the magnetosphere, instruments on Earth began to measure changes in our planet's magnetic fields. This usually results with the onset of a geomagnetic storm. While at the time of publishing, it was still a minor storm, rated a G1 on a scale of G1 to G5, it could intensify as the day goes by. What Does It Do? 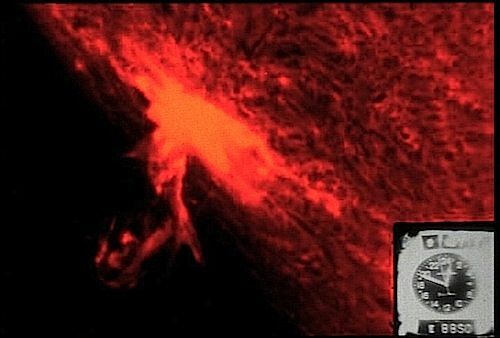 We have lived a few years of relative solar storm peace so this solar flare is triggering a fierce electromagnetic field disturbance compared to the past. The radioactive particles bombarding us from the solar flares could mess with many systems, ranging from electricity to GPS functionality. Solar flares and solar storms disrupt the Earth’s magnetic field which can lead to serious issues, such as disrupting GPS navigation, forcing certain planes to change course and even reroute, disrupting and knocking out power grids, blacking out radios and even interfering with cell phones and other connected devices. In other words, the two major flares could hinder those of you driving long distance today or going somewhere where you will need the help of your GPS could have trouble locating your destination. These are the most powerful solar flare eruption so far this year. As the day goes by, we will update on the solar flares and solar storm effects on the Earth and your driving. I'm waiting for someone to state the solar flares are a direct result of earth's global warming and fossil fuels.